Danny has an artificial limb and wears glasses. He’s the perfect target for bullies and ‘Mad Dog’ Fletcher is out to get him. Danny can’t play sport so longs to have a dog. Towards this end, he has been doing odd jobs for the lovely oldies in his area, and saving every penny. He doesn’t want any dog, he wants a Kelpie, to train and enter into the sheep dog trials at the Agricultural Show. He has read every book he could find, and watched every video available in preparation for the moment he gets the go-ahead from his parents. Joey is Danny’s best friend, confidant, and protector when things get rough. Joey is optimistic, lovable and daring. He balances Danny’s smart and responsible side well which makes for a perfect friendship. When Danny sees the physically-challenged pup in the pet shop, he knows it’s the one. They bond immediately and training the pup, which he names Sheeza, is a breeze. They end up winning the sheep dog trials at Wanganui. It’s when Sheeza is stolen that everyone joins the hunt to find her. Who could have taken her? Where can she be and will she ever be found? Posters, Current Affair programs, truckies with two-way radios across Australia and an informed public, set out to find and reunite the dog with the boy. 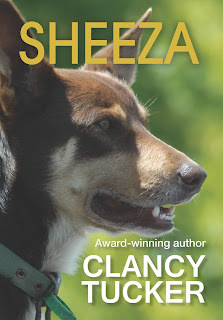 This is Clancy Tucker’s second novella. He’s a writer who loves to get his teeth into difficult themes and always manages to weave several issues into one story. A well-researched book, Sheeza incorporates detailed information about working dogs, their training and habits. I loved this story. It kept me reading without stopping until the end. As usual, there are fantastic characters - humans and animals, bad versus good in people, and problems that are overcome due to a tight community and strong friendships. To never give up is a powerful message that flows through all the issues addressed.